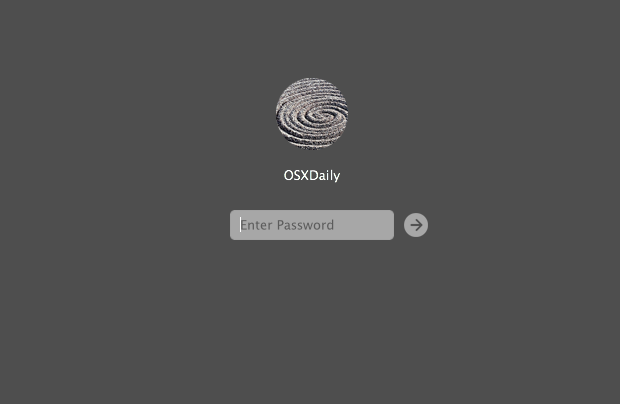 Rather than remembering a separate password and set of login information for unlocking a Mac, OS X offers the option to use an iCloud password to login to the computer at boot, reboot, authentication, locked screens, and all login windows instead. This is a helpful feature for users who like to keep things simple and use a single login and password for all Apple related tasks on their Mac, since the Apple ID can access iCloud, the App Store, iTunes Store, Mac App Store, FileVault, and quite a bit more. 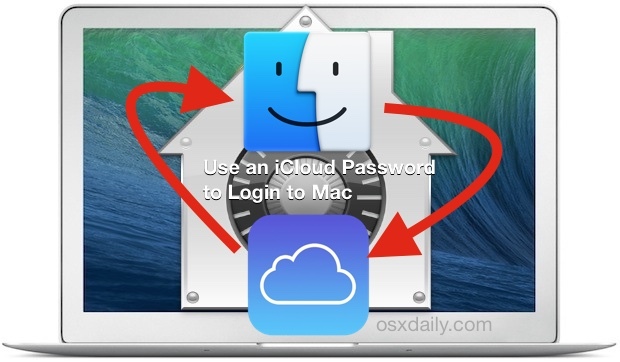 Allowing an Apple ID and iCloud password to unlock a Mac and login to OS X is quite simple, and when setting up a new Mac or a clean install with OS X Yosemite you may opt to do so directly, otherwise it can be enabled at any time by toggling the feature on. 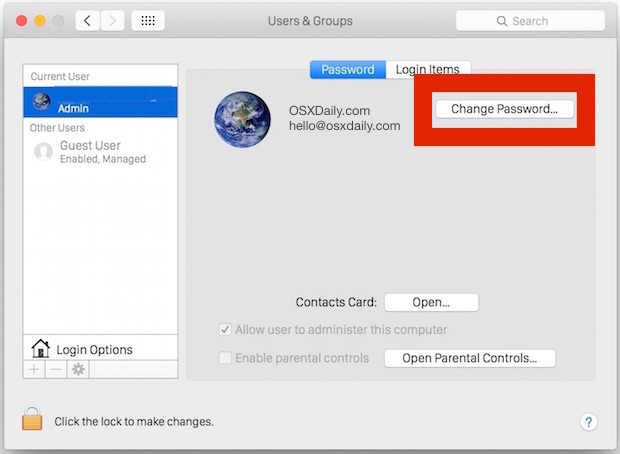 For the average Mac user, this can be an incredibly useful feature, but while this undoubtedly has significant conveniences, using a single login and password for multiple events is not necessarily recommended in all environments, and many advanced users in high security situations will find this feature inappropriate for their usage. The next time you’re at a login screen, either after system reboot, on network logins, at Fast User Switching login, a locked Mac screen, authenticating the root user, authenticating for administrative purposes, or just about any other imaginable situation where you’d be unlocking a Mac with a login screen in OS X, you’ll now use the Apple ID and iCloud password to login to the Mac. Effectively, your Apple ID becomes your user name and the iCloud password becomes your login password. Once this is configured, you” use that iCloud Password to login & unlock Mac OS X. While this does reduce the total number of logins and passwords necessary to remember, one potential issue with using the iCloud password for unlocking the Mac is that if you happen if you course if you lost your Apple ID password and login details, you’d need to recover it before being able to login to the Mac, as the Apple ID would no longer be able to function as a backup password in a forgotten password situation, which is something you can do when you have a separate password configured for logging into OS X and for the general Apple ID and iCloud experience. If you decide you don’t want to use the iCloud password for your own unlocking and logging in purposes, you can still set it as a valid network login option for not only your own user account, but for other iCloud users with an Apple ID as well. This has bad written all over it. I use a 60 character iCloud password and there is no way I’m typing that in to use my Macs… And if someone knows that password they also have access to your iCloud Pron. Yes – the reason I don’t use this is that if someone shoulder-surfs your password on your laptop, they have full access to your entire Apple account, without even needing physical access to any of your devices. I’m not sure if 2FA helps here. This may be helpful for logging onto a Mac for forgetful or lazy people but it’s bad to have all passwords be the same, at least use a variation of them. Add a number or ‘Mac’ on the end or something. Using this “feature” is really good advice for those naive enough to use simple, infrequently changed passwords for convenience. iCloud will be hacked eventually—if it hasn’t been already*—so I think it’s only prudent to keep my machine’s/machines’ passwords completely different from the iCloud password. And that means no saving the master passwords in the Keychain, either. Aside: even with my taking elaborate precautions, my iTunes acccount was hacked in 2008, leading to identity theft. Of course, Apple never owned up. Though iCloud and iTunes are separate things, one has to assume that the security structure for both has commonalities since the services are intertwined. Get a password manager to generate and store passwords (1Password rocks), keep the passwords complicated and un-mnemonic and change the really important ones on a regular, frequent basis. And no, that’s NOT just once every three months or more. Send me your gratitude on the back of a $20 bill, etc. *Because Apple hasn’t ever/would never admit to it. I seem to over-analyze these things, and tend to see trees where the view should be a forest. Whoever wrote the article is far too familiar with what he is writing about. He cannot see the difficulties for someone like me, a generation too old for this stuff. Does the new ‘much more secure’ password take the place of my simple one for logging in when booting or awakening from sleep? Does the new password let me get past the three typewritten pages of every god-forgotten password the at I need to refer to when I visit or return to sites that need log-in credentials? The writer does mention only Apple sites. I absolutely detest the need to remember ~100 different passwords. I tried a couple of programs that say they do that and was very much underwhelmed and disappointed. Finally, before developers spring this new stuff, thinking, forgive me, that they have covered all the bases, we should insist that their work be proofread by someone new to the subject and needs specific instructions to follow. Thanks to the preceding commentators who see dangers, in spite of whether or not the developer is offering a brilliant solution. I still don’t know if it is a brilliant solution because the developer can’t write clearly! I agree that all postings should be proofread — and by a non-power user senior citizen. I work with the senior citizens in my community with their computers and hand-held devices. If Apple could only see what the seniors are up against! And, PS: Please allow the user to “show password” as they type their passwords in all apps. A small thing that would really help our seniors. I have never trusted the cloud for the very reasons expressed in other comments. I want control over my content and not relying on an entity that may be compromised (It HAS happened). I have never trusted the cloud for the very reasons expressed in other comments. I want control over my content and not rely on an entity that may be compromised (It HAS happened). What is the difference between the iCloud password and the AppleID password, or are they always the same thing? I have a number of older clients who use their computers exclusively at home and are very forgetful and confused by passwords at best. This will be a great system for that type of user. There is no difference between a twenty-something and a senior citizen trying to remember 200 passwords, especially when three typos in a row requires a change of passwords. Once overenthusiastic password software messed things up and iCloud required me to change my Apple ID password three times in one day! Letting people choose to see the passwords in plain text does help with typos, but not with remembering the gazillion passwords, and it certainly doesn’t help us invent passwords, since every site has a different set of rules. This is a problem with the whole concept of passwords. Someone needs to invent a replacement for passwords that does not require prodigious memory or special equipment. Help me! When I click on change password that menu does not appear to me. I had an iCloud password than I changed to a local password, but now I want again to use iCloud password. But I don’t know why that that menu does not appear! Tiziano, I’d like to do this also, but unfortunately Apple doesn’t allow it in El Capitan. I know it used to be an option in Mavericks. Hi – I’ve got the same problem. I have been looking around my settings and tried to find resources on the internet, but there seems to be no solution to this problem. Once you change to setting up a separate password, you can’t change it back to using iCloud – is that a desired feature by El Capitan, or just a bug? same issue here..the option doesn’t pop up and I can’t go back using my iCloud password. not a big deal but still annoying. I have been talking to Apple support and unfortunately this feature has now been removed from macOS Sierra.